Scareware, rogue software, destroyware, call it what you will – if you become infected, you are in for a frustrating, time consuming, and in many cases, an expensive experience. There are literally thousands of these applications currently in the wild blue, just waiting for the unaware computer user to fall into the trap. It’s such a lucrative business for cybercriminals, that we are now dealing with a virtual epidemic of this type of malware. Most of these rogue application use social engineering to convince users’ to download this type of unsafe application, and let’s face it – a dialogue box that states “WARNING! Your computer is infected with spyware! – Click here to remove it!”, is a powerful motivator for many unaware computer users. But here’s the catch – clicking on the OK button starts an infection process by rogue security software. It’s as simple as that! 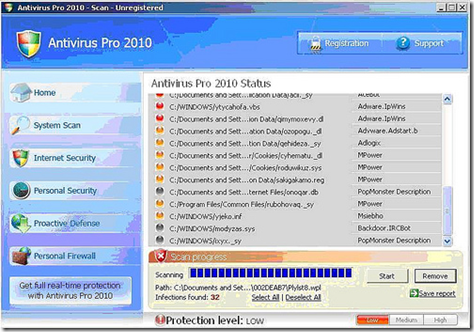 After installation, false positives; fake or false malware detection warnings in a computer scan, and the promise to remove them, is the primary method used to convince the unlucky victim to purchase the product. It’s a scam of course; but to make matters worst, the installation of rogue security software frequently leads to a critically disabled PC, or in the worst case scenario, allows hackers access to important personal and financial information. An example of a rogue security application getting ready to pounce. If you become infected by scareware then get your money out. Your wallet is going to take a hit – maybe two. The following factual stories, brought to my attention by the very people who have been victimized, will point out the frustration, and the expense, of having to deal with a rogue software infection. Victim #2 – “Unfortunately I fell for the “virus attack” after trying to remove it, gave in and bought the XPAntivirus. They charged me not only for what I had bought but charged me again, $ 78.83 for something which I hadn’t ordered, nor ever received. 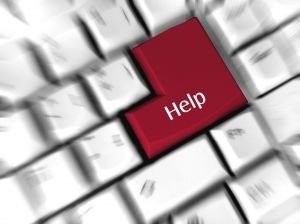 It was a nightmare trying to get in touch with anybody, and I finally connected with a guy with an accent, who told me to E-mail the billing service re: my problem. I wrote them tried to call, it’s been a week, and they still won’t contact me to clarify what occurred. I printed off a purchase order from them when I bought the XP which verifies what I received. Anybody know what state their in, I’ll notify the states attorneys office. These people are crooks”. Having watched the development and deployment of scareware over the last two years, and having noted the increasing sophistication of the current crop of scareware applications, I have reluctantly come to the conclusion that scareware removal instructions have limited value, except perhaps, for the most technically sophisticated computer user. The best advice? Have your PC worked on by a certified computer technician, who will have the tools, and the competency, to determine if the infection can be removed without causing system damage. However, if you have become infected by scareware, and you want to try your hand at removal, then by all means give it a try. There are literally hundreds of sites that will walk you through the process of attempting to eliminate this type of scourge, but the following sites are among the best I’ve found, at providing the tools, and the advice, you will need to attempt removal. SmitFraudFix – available for download at Geekstogo is a free tool that is continuously updated to assist victims of rogue security applications. The following recommendations are repeated (particularly for new or inexperienced users), on what steps can be taken to reduce the probability of having to deal with a rogue software infection. I was infected by one of these parasites and it cost me big money to get rid of it. There’s no doubt, being infected by this type of malware can be devastating, and as you learned, unfortunately – it can be expensive. Thank you for commenting. Hopefully, other readers can learn from your experience. In my early days when I tend to download pirated content I face it once but thanks to Malwarebytes which help me to get cure. Recently I tested a similar scareware in my virtual PC and you know what now they don’t allow you to install Mallwarebytes or any other curing program but when I pre-install it I can easily scan and remove it. So, my advice is install any of the above program now. You’re quite right, rogue software will often not allow downloading/installing of removal applications. This is one reason I recommend 411 Spyware, and Bleeping Computer, since both sites offer excellent advice on *manual* removal. As well, SmithFraudFix, which I recommend, will install, and is an excellent remedy for scareware removal. In every case though, a very high level of computer knowledge is a definite necessity. This is the principal reason why I suggest an infected machine should be taken to a professional. Great advice. And for those not technically savvy, once you have installed the recommended security software, if you see a message your computer is infected, you will know with confidence that it is rubbish, because the security software that you already have would have nabbed it. As always, spot on advice. Much appreciated. Good luck to all and stay safe! Mark Russinovich is THE man! Thanks for a great piece of advice.